Doing business today is a connected, global affair as a result of advances in technology and the rise of emerging markets. For the finance industry, this business environment poses a significant challenge. Finance leaders increasingly find themselves embedded in numerous lines of business, providing not just analytical capacity but people management and strategic direction. In fact, by 2020 cross-functional integrated teams will deliver 80 percent of traditional finance services. This shift will require hiring managers to cultivate soft skills not traditionally associated with the finance sector – including communication, collaboration, technological savviness, and flexibility. Look no further than Military Veterans! As my colleague Andy Mangas recently shared, to undertake such positions, active duty members are trained by the brightest minds to ensure proficiency in their knowledge and skills in an ever-changing military-technology environment. For example, the Military is embracing tablet technology in IT, construction and financial services, with these skills translating to many sectors. “I can teach the banking and sales side to the right candidate, but I can’t teach passion, communication or coach-ability.” Ever been here? If you ask a Military member or Veteran, their core values predominantly include some variation of these traits. These men and women are often in charge of large teams, carefully trained on how, when and what they communicate, and responsible for the safety of both people and valuable business assets. The finance industry is far from static. Change happens at moment’s notice and, though proactivity is sought after, many times professionals are forced to adjust on the fly. Similarly, Military members thrive in ever-evolving situations. They are use to change, and quick to adapt to any situation. Veterans flexible, but they are also trusted to take ownership of a situation on short notice or with little to no guidance. Veterans are fundamentally trained to put others before themselves. You're probably thinking: ‘they don’t know the ins and outs of products and services, they don’t have traditional sales experience.’ Depending on the role, is a seasoned or set-in-their-ways candidate always ideal? Wouldn't you rather have a teammate with a relentless desire to learn and willingness to grow into a top financial performer or a analytical genius? In my experience, not enough hiring managers consider character and personality on par with qualifications. Veterans join the Military with little to no idea where their speciality will lie; hence, they have an uncommon desire to learn, grow, train, and fail forward. They often have financial experience, too! In fact, a typical member of the Military is expected to perform at a position two levels above their current station. These men and women are given significant financial responsibilities including: managing budgets, analyzing reports to make key decisions, and responsibility for multimillion dollar assets. It’s time for us to recognize these abilities as our own. Anxiety about the availability of key talent continues to grow – in the past five years alone, the percentage of finance executives expressing concerns about finding the right talent has grown nearly 15 percent. These worries are not entirely unfounded as the supply of talent that bridges this gap remains limited and in high demand. The benefits of exploring Veterans' abilities in this field are too valuable to ignore. Jessica is a Recruitment Consultant Team Lead, covering the Finance industry and based in Charleston, South Carolina. 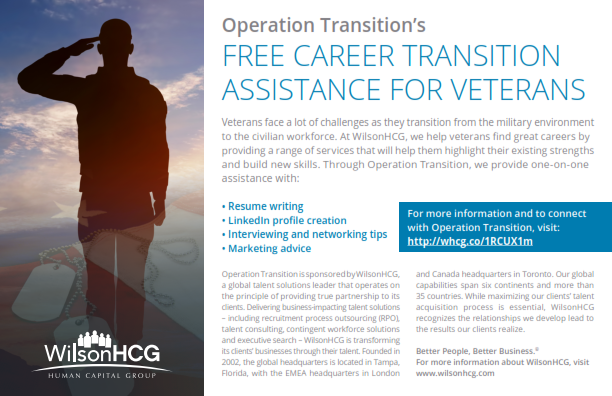 She has spent nearly five years in the talent acquisition industry, is a proud member of WilsonHCG's Operation Transition, and enjoys traveling, reading as well as spending time with her husband and son who recently graduated kindergarten.